One Sunday morning the warm sun came up and - pop! - out of the egg came a tiny and very hungry caterpillar. I often tell people about the four magic letters: DO IT. The hardest part is developing the idea, and that can take years. Let's put it this way: if you are a novelist, I think you start out with a 20 word idea, and you work at it and you wind up with a 200,000 word novel. We, picture-book people, or at least I, start out with 200,000 words and I reduce it to 20. Over time I have come to believe many children can identify with the helpless, small, insignificant caterpillar, and they rejoice when it turns into a beautiful butterfly. I think it’s a message of hope. It says: I too can grow up. I too can unfold my wings and fly into the world. I often tell people about the four magic letters: DO IT. I want to be encouraging but I can only offer the example of my own experience, which is just one approach. There are many wonderful picture book artists to learn about, which is important. But you must use your own imagination. You have to just do it. Whether it's a coffee cup, or a poster, or a book illustration, or a typeface, it has to be designed in such a way that it is not trashy, and doesn't pollute your eye. We have so much pollution out in the air. Our eyes are being polluted. We have visual pollution out there, and I have a very strong sense about that. One day I think it's the greatest idea ever that I'm working on. The next day I think it's the worst that I've ever worked on – and I swing between that a lot. Some days I'm very happy with what I'm doing, and the next day I am desperate – it's not working out! And then finally, it's just right – and that just right, it's just a feeling. There's nothing scientific about it. You know, now it's sinking in. It's taken me a long time to realize – and it is sinking in – how important this book is. And I have a certain distance now. I've done it such a long time ago. And when I did it, it really wasn't a very important book. It was just a nice book and I enjoyed doing it, certainly. And I liked it, obviously. But I never imagined that it would become so important to so many children. My friends and I and my editors talk about, "What is the success of this book? Why do children love it?" We haven't come up with an answer, but I think what it is is it's a book of hope. You little, ugly, little, insignificant bug: you, too, can grow up to be a beautiful, big butterfly and fly into the world, and unfold your talents. Now, I didn't think of this when I did the book, but I think that is the appeal of the book. On Saturday he ate through one piece of chocolate cake, one ice-cream cone, one pickle, one slice of swiss cheese, one slice of salami, one lollipop, one piece of cherry pie, one sausage, one cupcake, and one slice of watermelon. That night he had a stomachache! The next day was Sunday again. The caterpillar ate through one nice green leaf. And after that he felt much better. But now he wasn’t hungry anymore. And he wasn’t a little caterpillar anymore. He was a big fat caterpillar. He built a small house around himself, called a Cocoon, And he stayed inside for more than two weeks. 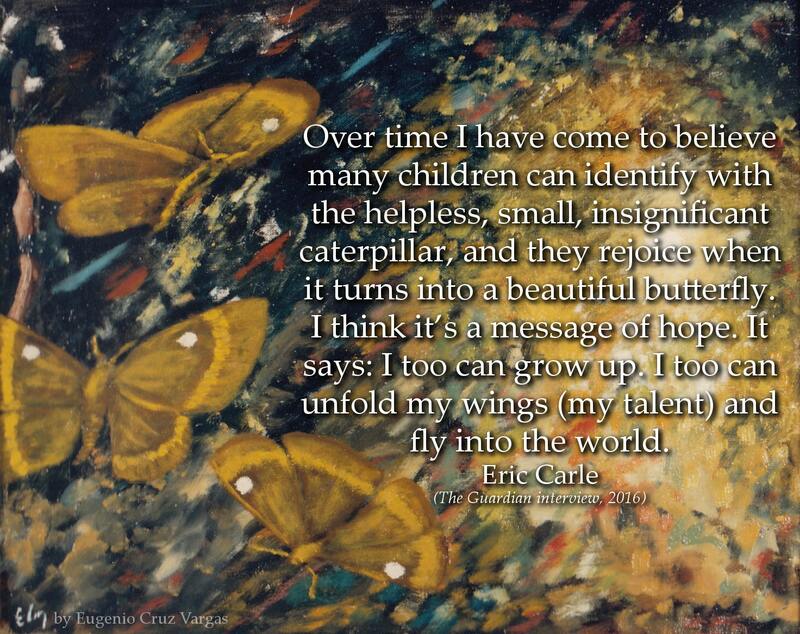 Eric Carle is an American illustrator and author. 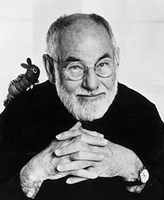 He is best known for his world-wide famous works, most notably The Very Hungry Caterpillar, a picture book for children.